Cellphone universal 6,2” waterproof case for iPhone, Samsung, Huawei, BQ Aquaris, LG, Sony, Motorola, coins, passport, etc. Available in black and pink colour. Ideal for introducing mobile devices safely into pig farms. IPX8 certification: It has an IPX8 certification. It is waterproof up to 10 m. All our waterproof cases are subject to water immersion tests for 2 hours at least, so all our customers can rely on a safety beyond all doubt. N.B. : Carry out a safety test before using the product. Simply introduce a handkerchief inside the bag and leave it submerged in water for 30 minutes. Then remove it and verify if the handkerchief is wet or not. Compatibility: For 4.0”-6.2” mobile phones and compact cameras, such as iPhone X / 8 (Plus) / 7 (Plus) / 6 6S (Plus) / SE / 5S/ 5, Samsung Galaxy S9/S9 Plus/S8/S8+/S7/S7 Edge/S6/S6 Edge/Edge+, Note 5/4/3/Edge, Huawei P20/P20 Lite/P10/P10 lite, BQ Aquaris, LG, Sony, Motorola, etc. You can also use it for your wallet, passport, keys, etc. Protect your mobile phone and personal belongings. 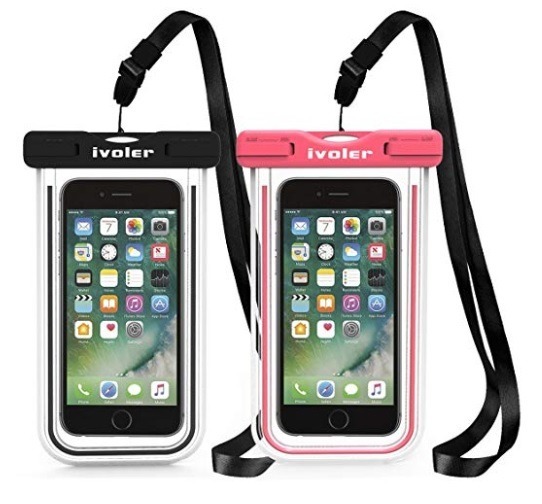 Convenient: The waterproof bag has an ABS buckle, double-sided see-through windows so you can take photographs with the front and rear cam and you can use your mobile phone conveniently, and also send and receive messages, e-mails, and make and hear phone calls. Multifunction: It contains a sports bracelet, and it is perfect for any sport. You can wear it around your neck or your hand. Easy to carry around. Additional compass function, suitable for outdoor activities, such as diving, running, swimming, hiking, travels, etc. The bag has phosphorus lines on its edges, this making it safer and visible when dark. Contents of the package: 1x Waterproof case, 1 x Adjustable cord.